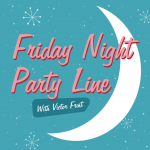 Tonight on Friday Night Party Line we have Nelson, Churba, FNPL Veteran Viga the Otagal, and newbie David Manglano! Topics: New version of Carl Sagan’s “Cosmos” featuring Neil deGrasse Tyson Elon Musk’s Hyperloop Transit System The future of civilian drones What’s entertaining us? Episode 59 – Churba, Meet Snow. Tonight on Friday Night Party Line, we have the usual suspects: Adam, Nelson, and Churba Topics: Short: Google Self Driving Car Criminalization of Blasphemy under UN Discussion (suggested by Churba) Green Bay referee debacle Do you listen to Radio? What do you think Radio can do to get people back?